Flowers, candy and jewelry – those are the traditional gifts couples exchange. This year, Alexis Hilton, a physician’s assistant with Extended Care Physicians, gave her husband Steve the gift of health. She donated her kidney to him on January 13. Just a little over two weeks later, Hilton, 33, returned to work providing geriatric nursing care in four senior living communities in Hickory including Hickory Village Memory Care, a DePaul Senior Living Community. 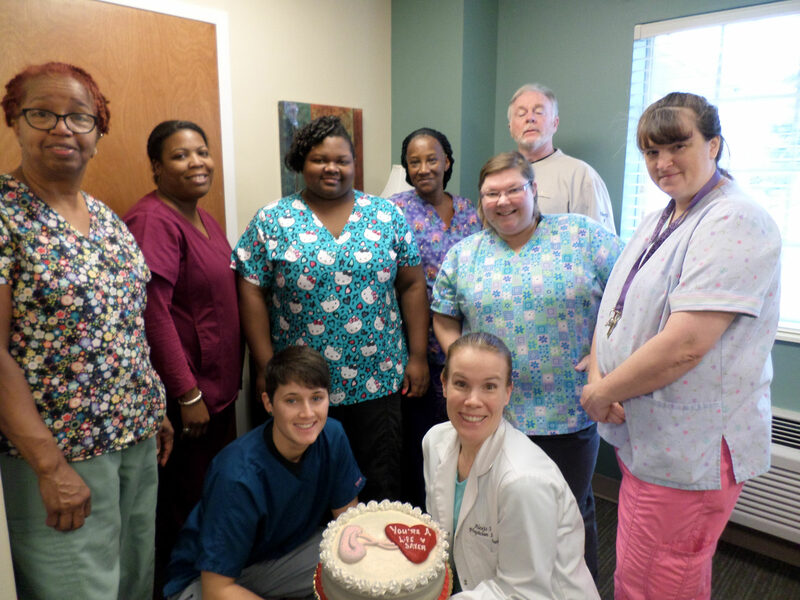 Hilton’s welcome back party, complete with a kidney cake! “She is such a caring individual and our residents are so blessed to have her as their health care provider,” said Hickory Village Memory Care Activities Director Anna Wilson. 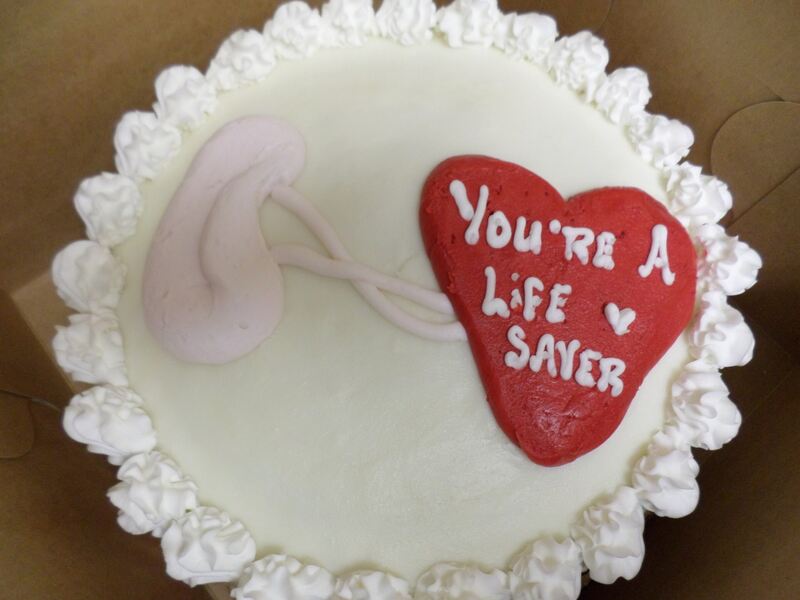 The staff at Hickory Village Memory Care welcomed her back with a party including a cake in the shape of a kidney. Hilton, a registered organ donor, said she and her husband chose to have the surgery done in January to begin the year with good health. With March being National Kidney Month and National Donate Life Month in April, Hilton is hoping that sharing her own family’s experience will raise awareness about the possibility of being a living organ donor. Hilton met her husband Steve, 39 and an account manager at Aaron’s, eight years ago on St. Patrick’s Day. The two have been married for five years and have a one-year-old daughter, Samantha, and two dogs. When the couple started shopping for a large home in which to raise a family, they applied for life insurance. A home health visit revealed Steve’s creatinine levels were extremely elevated. Creatinine is a measure of the waste in the blood, waste which a set of normal functioning kidneys would be able to regulate. Further testing revealed the portion of the kidney responsible for filtering waste and protein in the urine was inflamed, also known as idiopathic membranous glomerulonephritis. That was two years ago. While Alexis was pregnant with Sam, her twin sister Rebecca Cofer, and a friend were both tested to see if they were a match for Steve. “When I found out both were not a possibility, I immediately said, ‘It’s my turn,’” said Alexis. 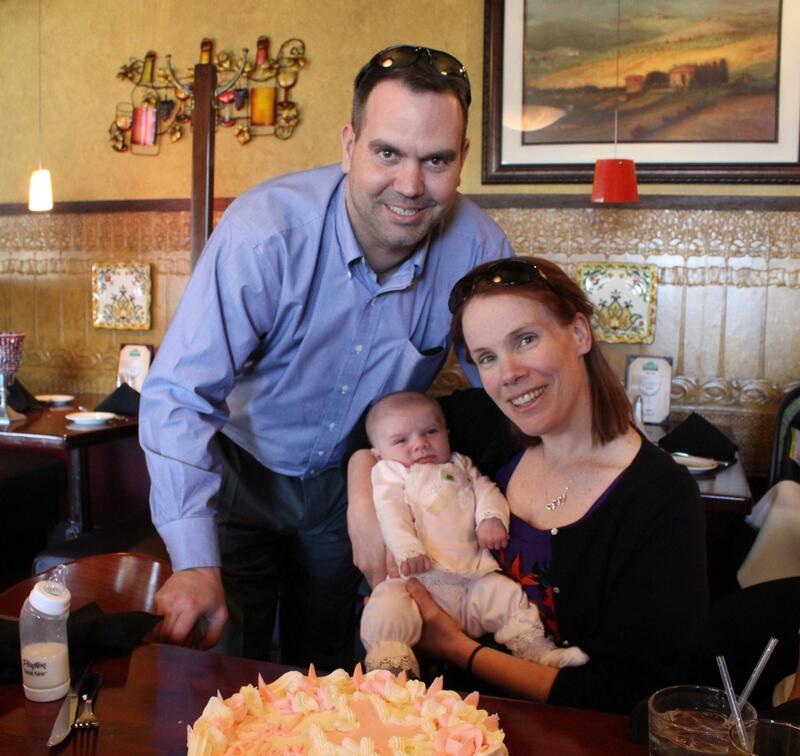 Six months after giving birth, it was determined Alexis was a match. She passed all the medical criteria qualifying her to be a living organ donor for her husband. On January 13th, Alexis and Steve’s family and friends donned “Hilton Kidneypalooza 2015” shirts as the couple entered the operating room side-by-side for the surgery. Alexis’ surgery took about four hours; Steve was in for about eight. She was discharged two days after surgery, with Steve getting out just one day later. Steve’s creatinine levels are back in the normal range. Alexis said she was not surprised the staff at Hickory Village Memory Care planned a party in honor of her return. Alexis said the experience has given the couple even more reasons to count their blessings. “I tell him all the time how much I appreciate him and I talk about him all the time,” she said.